In today’s world, it is more acceptable to be depressed than to be lonely-yet loneliness appears to be the inevitable byproduct of our frenetic contemporary lifestyle. According to the 2004 General Social Survey, one out of four Americans talked to no one about something of importance to them during the last six months. Another remarkable fact emerged from the 2000 U.S. Census: more people are living alone today than at any point in the country’s history fully 25 percent of households consist of one person only. In this crucial look at one of America’s few remaining taboo subjects loneliness Drs. Jacqueline Olds and Richard S. Schwartz set out to understand the cultural imperatives, psychological dynamics, and physical mechanisms underlying social isolation. 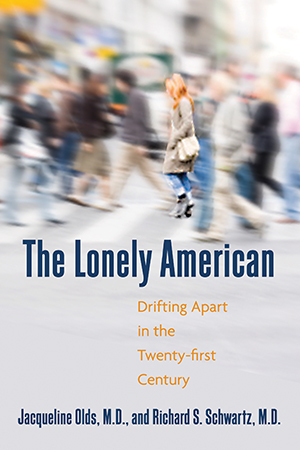 In The Lonely American, cutting-edge research on the physiological and cognitive effects of social exclusion and emerging work in the neurobiology of attachment uncover startling, sobering ripple effects of loneliness in areas as varied as physical health, children’s emotional problems, substance abuse, and even global warming. Surprising new studies tell a grim truth about social isolation: being disconnected diminishes happiness, health, and longevity; increases aggression; and correlates with increasing rates of violent crime. Loneliness doesn’t apply simply to single people, either today’s busy parents “cocoon” themselves by devoting most of their non-work hours to children, leaving little time for friends, and other forms of social contact, and unhealthily relying on the marriage to fulfill all social needs. As a core population of socially isolated individuals and families continues to balloon in size, it is more important than ever to understand the effects of a culture that idealizes busyness and self-reliance. It’s time to bring loneliness a very real and little-discussed social epidemic with frightening consequences-out into the open, and find a way to navigate the tension between freedom and connection in our lives. "There's been plenty written this year about loneliness, but little of it is as revealing as The Lonely American. . . . Harvard psychiatry professors Jacqueline Olds and Richard Schwartz get right down to illuminating the social impulses that have pushed us apart, from deep cultural myths (such as the self-reliant American) to more basic narratives that have slipped into daily life ('It's too bad that we've lost touch, but that's just the way it is')." "The Lonely American is a valuable book. . . . It is one of the few books that manages to make social psychology appear interesting and able to tell us something that we did not already know." "In this haunting book, Drs. Jacqueline Olds and Richard Schwartz have pinpointed the intriguing process that drives us to seek out solitude and then defend our choice even when it makes us miserable. . . . While The Lonely American is at times a heartbreaking book to read, its silver lining comes from the simplicity of the solution Olds and Schwartz propose: reach out rather than withdraw. They argue powerfully that the 'obligations' many Americans have sought to avoid may just be the salvation for which they secretly long." "This intriguing and well-written book raises serious concerns about growing social isolation in the United States. . . . [Olds and Schwartz] posit a core conflict between our wish to connect and our wish to be free. . . . The book summarizes the harmful effects of feeling left out." "In The Lonely American, Schwartz and his wife Jacqueline Olds, both Harvard psychiatrists, argue that marriages need a wider web of social support. Americans, they say, have been burrowing in, trying to escape from the obligations and time-drain of wider social ties, but by doing so, they have actually been destabilizing their own relationships." "An intriguing, cautionary critique . . . [a] call to break through the potentially narcissistic intensity of the therapeutic encounter." "Olds wrote the book with her husband, Dr. Richard Schwartz, because, she said, she wanted to bring loneliness 'out of the closet.' The two were struck by findings from the General Social Survey (conducted by the National Opinion Research Center at the University of Chicago), showing that people reported having fewer intimate friends in 2004 than they had in 1985. When asked how many people they could confide in, the average number declined over that same time period from three to two. In 2004, almost a quarter of those surveyed said they had no one to discuss important matters with in the past six months; in 1985, only 7 percent were devoid of close confidantes." "Thought-provoking, engagingly lucid . . . [Olds and Schwartz] have written a wise, balanced, and evocative inquiry; their finger is on the pulse of something very real." "This workmanlike book takes up where Robert D. Putnam's classic Bowling Alone left off in examining the disintegration of community in 21st-century America. Americans, say the authors (both associate clinical professors of psychiatry at Harvard Medical School), have a conflicted views of community: on the one hand, they glorify rugged individualism and, on the other hand, they encourage community and look down on those who cast off community to go it alone. Drawing on interviews with their patients and on numerous studies, Olds and Schwartz point out that being a loner isn't all it's cracked up to be, and many who shun community are surprised at how lonely and socially isolated they feel. The authors conclude that Americans drift away from social connections because of the frenetic and overscheduled intensity of modern life as well as the American pantheon of self-reliant heroes." "This recent addition to the sociological and psychological literature on loneliness is a substantive contribution. . . . The authors capture the essence of our depressed and disjointed culture"
This argument probably began as soon as language made it possible for groups to argue, but it is also a particularly American controversy. Over the last decade, the debate about freedom and connection in the United States has leaped from rarely read doctoral dissertations to front-page national news. What caught people’s attention was a series of alarms, given in the form of data-driven studies, suggesting that our society is in the midst of a dramatic and progressive slide toward disconnection. Robert Putnam’s Bowling Alone was the loudest alarm, combining extensive data on the fraying of social connections with a powerful thesis demonstrating the importance of social networks to a healthy democracy. The book struck a chord and seemingly endless pub-lic debate about whether or not Putnam was ignoring new forms of connection that were every bit as effective as the waning old forms. Questions ranged from the trivial (don’t burgeoning youthsoccer leagues matter as much as disappearing bowling leagues) to the technological (what about the Internet and cell phones). These issues were brought into sharp focus recently by two major studies. In the first, using data from the General Social Survey (GSS), a group headed by Duke University researcher Miller McPherson found that between 1985 and 2004, the number of people with whom the average American discussed “important matters” dropped from three to two. Even more stunning, the number of people who said there was no one with whom they discussed important matters tripled: in 2004, individuals without a single confidant now made up nearly a quarter of those surveyed.1 Our country is now filled with them. For readers who remain skeptical, it is worth noting that the authors of the study themselves were skeptics. They were surprised by their own results; they had expected to prove Putnam wrong. The second study was the 2000 U.S. census. One of the most remarkable facts to emerge from this census is that one out of every four households consists of one person only. The number of one-person households has been increasing steadily since 1940, when they accounted for roughly 7 percent of households; today, there are more people living alone than at any point in U.S. history. 2 Placing the census data and the General Social Survey side by side, the evidence that this country is in the midst of a major social change is overwhelming. The significance of this increased aloneness is amplified by a very different body of research. There is now a clear consensus among medical researchers that social connection has powerful effects on health. Socially connected people live longer, respond better to stress, have more robust immune systems, and do better at fighting a variety of specific illnesses. These medical benefits derive directly from the social connection itself, not just from lifestyle improvements, such as better diet, more exercise, and better medical care, that might go along with it. Putnam argues that social connection is good for the country. Medical research has clearly demonstrated that social connection is good for individual health. Yet people in this country continue to drift apart. We want to understand why. When Slater looked at the America of his day, he saw people who actively sought the very things that made them unhappy and bitter. He also asked why, but his answer got stuck in its particular historical moment. He wrote at the height of the Vietnam War, a time of increasingly intense confrontation between a mix of countercultural student radicals and hippies and what Slater labeled the “old culture.” Much of the book is a brilliant rant against the dominant culture by a writer who believed that society was poised on the brink of cataclysmic transformation. His subtitle was American Culture at the Breaking Point, but after more than four decades, nothing has broken. What we have instead is more of the same-- more isolation (and more objective data on that isolation), more longing for connection, and more technology that promises better connections but never quite delivers. It is time to revisit Slater’s questions and seek answers for our own time. We came, and still come, to these questions as psychiatrists. Our first concern was the welfare of our patients: we began to notice how much of their suffering was bound up in isolation and loneliness, whatever other diagnostic labels might be applied to them. We began to notice how hard it was for our patients to talk about their isolation, which seemed to fill them with deep shame. We began to notice that most of our patients were more comfortable saying they were depressed than saying they were lonely. Somehow, while our culture has successfully destigmatized mental illness (at least a little), it has restigmatized an ordinary human emotion. Finally, we began to notice versions of the same suffering around us in friends, family, and acquaintances, and, again, what puzzled us more than the disconnection itself was an almost reflexive denial that it mattered. Someone would talk at length and with great sadness about losing contact with formerly close family members and friends, and then the whole subject would be shrugged off as if it were just a minor inconvenience in a typically busy life. The word lonely was determinedly avoided, yet the denial of loneliness is horribly self-defeating. Health and happiness, the two things we all say matter most, are certifiably linked to social connectedness. Do Lonesome Cowboys Sing the Blues?